Ice cream . . . what could be simpler? Ice cream in various guises has been known for centuries, even before the invention of freezers! The likes of Julius Caesar was said to have enjoyed it, it may have been fresh snow combined with fresh fruits and maybe some cream added but it seems we have long held this frozen delight in great esteem. 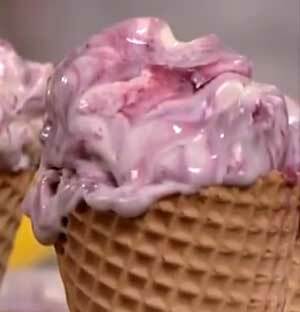 Another story says that at an exhibition in the USA an ice cream vendor was next to a waffle maker and after running out of dishes for the ice cream they put their heads together and through accident rather than design the ice cream cone was born. What could be nicer with summer approaching the northern hemisphere than making and enjoying your very own, fresh ice cream at home? It need not be complicated either. This week I will share with you a few ways that luscious, fresh, creamy ice cream can be made at home. Hopefully I will cover all the bases or problems that you may have previously encountered with this task like not having an ice cream machine, basic mixture splitting, etc. Join me next week for a couple of ice cream recipes with a difference! Obviously a great recipe is a must but more than that, one must understand what is happening at a chemical level as it is being made to truly make a great ice cream. As the mixture starts to freeze, ice crystals are formed. To achieve a true smooth finish the production of small ice crystals is a must. Achieving this is a combination of freezing the mixture as quickly as possible and / or churning. This is precisely the reasons why ice cream making at home is best done with a small ice cream machine. Interestingly if you were to pour liquid nitrogen into your basic mixture, it would freeze down in less than a minute and the tiniest of crystals would form and strangely enough you would have to wait for it to warm up before you could eat it! Let me first of all answer the question most often asked. Do you need an expensive ice cream machine? No you do not. Of course, if you can afford one and intend to make fresh ice cream often then they are a great investment. If you just intend to make the occasional batch for a special dinner party, then there are ways around not having a machine . . . as I will share with you this week. Fresh custard base, tinned or packet? Most (but not all) ice creams are made from a custard base to which flavourings are added. The true aficionado will go for the fresh, home made custard base and why not? You have so much more control over its texture, creaminess or reduced fat content (by making with skimmed milk), its vanilla flavour and of course its total lack of additives and preservatives. That said, if you have no time, patience or skill for making fresh egg custard (omit the saffron) then I suggest the tinned version over the packet as this tends to be not so strong in vanilla or artificial flavours . . . but this does depend on your local brands, etc. For the most part these are best added to the fresh custard as you are making it, if you are using pre-made tinned custard, heat it through and add the flavouring ingredients. The list is endless. An important point to remember however is that food loses its flavour when frozen, so you must flavour the custard quite strongly to allow for this flavour loss. It normally takes a couple of attempts to find your taste levels. To add your favourite alcohol flavour such as Cointreau, whisky, etc to your ice creams, you need first of all to remove the actual alcohol content as the alcohol will retard or prevent the ice cream from freezing. This can be achieved by pouring the liqueur into a pan, carefully heating and very carefully igniting it. Once the flame has died out the alcohol has been removed and what is left is basically pure flavour. To make a beer flavoured ice cream . . . join me next week! Care should be taken not to overfill the machine's bowl as the mixture will expand during the churning process. It is recommended that the bowl is filled no more than two-thirds full with the initial mixture. I have suggested a quarter of a vanilla pod or half a teaspoon of vanilla essence, this is presuming you will be using it as a base and actually flavouring your ice cream with other fruits, essences, etc. If you love fresh vanilla ice cream increase to half or one pod or one teaspoon of essence. Whenever making Crème Anglaise with fresh vanilla it is also nice to leave the vanilla seeds in - it leaves an attractive finish to the ice cream and shows the guests that fresh vanilla was used. Enjoy your ice cream and bon appetit . . . . .